CMCI brings extensive Continuous Integration/Continuous Delivery (CI/CD) Service (DevOps) capabilities to speed the pace of innovation and expedite the delivery of modern solutions for our customers’ ever-changing business and technology needs. 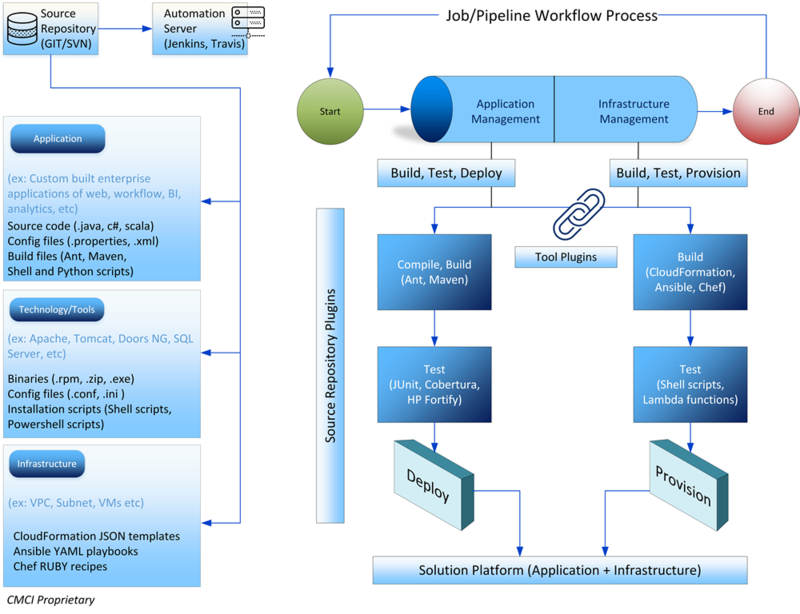 Our DevOps approach provides a customized CI/CD workflow model grounded in Agile-based DevOps methodologies and the principles of the Digital Services Playbook. This model provides a holistic, end-to-end solution that streamlines your deployment pipeline and uses the power and efficiency of automated builds and test automation to reduce deployment lead time, improve code quality, and ultimately create a more cost-efficient Software Development Life Cycle (SDLC) to support your mission. In contrast to traditional siloed approaches to development, we work in highly-collaborative, cross functional teams wherein developers and testers work closely together to ensure the delivery of quality code that meets all business requirements, governance mandates and user expectations. This approach produces faster solutions, reduces the need for bug fixes, and streamlines both processes and resource utilization.